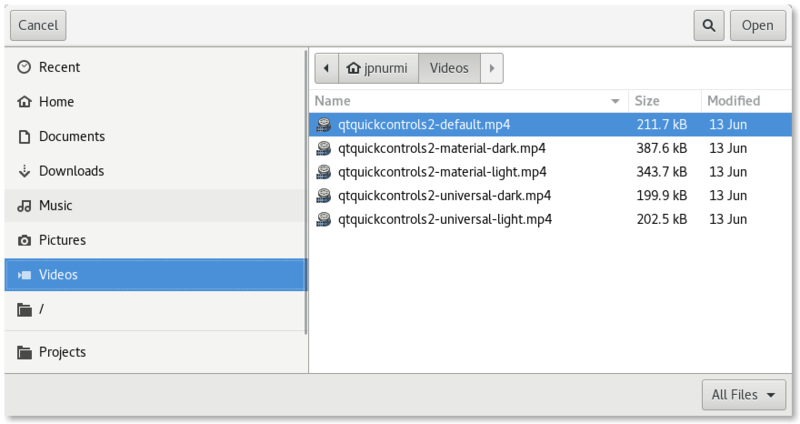 The FileDialog type provides a QML API for native platform file dialogs. To show a file dialog, construct an instance of FileDialog, set the desired properties, and call open(). The currentFile or currentFiles properties can be used to determine the currently selected file(s) in the dialog. The file and files properties are updated only after the final selection has been made by accepting the dialog. See also FolderDialog and StandardPaths. This property holds the label text shown on the button that accepts the dialog. When set to an empty string, the default label of the underlying platform is used. The default label is typically Open or Save depending on which fileMode the dialog is used in. This property holds the currently selected file in the dialog. Unlike the file property, the currentFile property is updated while the user is selecting files in the dialog, even before the final selection has been made. See also file and currentFiles. This property holds the currently selected files in the dialog. Unlike the files property, the currentFiles property is updated while the user is selecting files in the dialog, even before the final selection has been made. See also files and currentFile. This property holds a suffix that is added to selected files that have no suffix specified. The suffix is typically used to indicate the file type (e.g. "txt" indicates a text file). This property holds the final accepted file. Unlike the currentFile property, the file property is not updated while the user is selecting files in the dialog, but only after the final selection has been made. That is, when the user has clicked OK to accept a file. Alternatively, the accepted() signal can be handled to get the final selection. See also currentFile and accepted(). This property holds the mode of the dialog. FileDialog.OpenFile The dialog is used to select an existing file (default). FileDialog.OpenFiles The dialog is used to select multiple existing files. FileDialog.SaveFile The dialog is used to select any file. The file does not have to exist. This property holds the final accepted files. Unlike the currentFiles property, the files property is not updated while the user is selecting files in the dialog, but only after the final selection has been made. That is, when the user has clicked OK to accept files. Alternatively, the accepted() signal can be handled to get the final selection. See also currentFiles and accepted(). This property holds the folder where files are selected. For selecting a folder, use FolderDialog instead. This property holds the filters that restrict the types of files that can be selected. Note: *. * is not a portable filter, because the historical assumption that the file extension determines the file type is not consistent on every operating system. It is possible to have a file with no dot in its name (for example, Makefile). In a native Windows file dialog, *. * will match such files, while in other types of file dialogs it may not. So it is better to use * if you mean to select any file. FileDialog.DontResolveSymlinks Don't resolve symlinks in the file dialog. By default symlinks are resolved. FileDialog.DontConfirmOverwrite Don't ask for confirmation if an existing file is selected. By default confirmation is requested. FileDialog.ReadOnly Indicates that the dialog doesn't allow creating directories. FileDialog.HideNameFilterDetails Indicates if the file name filter details are hidden or not. This property holds the label text shown on the button that rejects the dialog. When set to an empty string, the default label of the underlying platform is used. The default label is typically Cancel. These properties hold the currently selected name filter. index : int This property determines which name filter is selected. The specified filter is selected when the dialog is opened. The value is updated when the user selects another filter. [read-only] name : string This property holds the name of the selected filter. In the example below, the name of the first filter is "Text files" and the second is "HTML files". [read-only] extensions : list<string> This property holds the list of extensions of the selected filter. In the example below, the list of extensions of the first filter is ["txt"] and the second is ["html", "htm"].